The agreement with the Canadian investment firm covers four hotels and stake in Mumbai's The Leela Hotel apartment from joint development of other properties. The Leela Palace Kovalam. 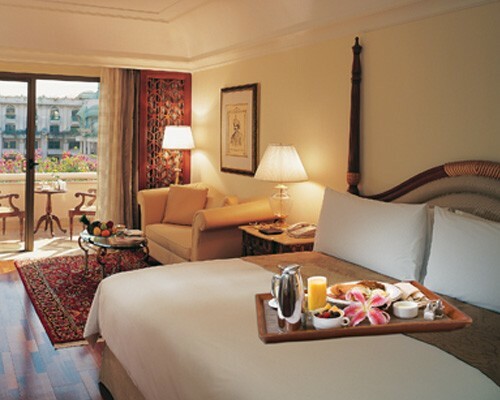 Canadian investment firm Brookfield has signed an agreement to take over four hotel properties of the Leela Group. Picture courtesy: www.theleela.com. Debt-hit hospitality group Hotel Leela Venture will sell its assets to Canada-based private equity firm Brookfield Asset Management for Rs 3,950 crore under a deal that covers four hotels – in Bengaluru, Chennai, Delhi and Udaipur – on a slump sale basis, media reports say. The deal also gives Brookfield a 100 per cent shareholding in Leela Palaces and Resorts Ltd, which holds the licence to develop a hotel property in Agra. These assets account for nearly 80 per cent of Leela's revenues and 88 per cent of the company's net worth. The Leela Group will continue to operate a hotel in Mumbai and own some land in Hyderabad and continue to jointly develop residential apartments with Prestige Developers in Bengaluru. Brookfield will have the right of first refusal over the company's Mumbai hotel. The hotel chain said in a communication to the Bombay Stock Exchange (BSE) that the sale proceeds would go to repay its lenders. "After the completion of the aforesaid transaction, all borrowings of the company from all banks and financial institutions would stand repaid," the statement said. News about the deal buoyed Hotel Leela Venture share in the National Stock Exchange (NSE) to rise 5 per cent in early trading on Tuesday to touch 11.55 from the previous close of 11. Under the agreement, Brookfield will pay Rs 150 crore for all the intellectual properties of Hotel Leela Venture including the 'Leela' brand to Brookfield. The deal also makes the Leela Group sign a separate licence and centralised services agreement for The Leela Hotel, Mumbai, and transfer of leasehold rights for 24,404 square metres of land on Old Airport Road, Bengaluru, to Brookfield, a report in the Business Line says. The two parties will form a joint venture to carry out development activities in the future. Ankur Gupta, managing director and head-India real estate of Brookfield, told Business Line: "The Leela is one of the finest hospitality groups in India and over the years it has gained extraordinary recognition from some of the most prestigious authorities on travel and luxury in the world. We are excited with this opportunity and look forward to completing this transaction at the earliest while ensuring that all operations remain unaffected." JM Financial Asset Reconstruction Co, which is Leela's biggest lender, had approached the Mumbai bench of the National Company Law Tribunal (NCLT) seeking proceedings under the Insolvency and Bankruptcy Code (IBC) after the company failed to arrive at a debt resolution plan. The total debt burden of Leela at the end of December 2018 stood at Rs 6,164 crore, the company's losses having grown to Rs 89 crore in the nine months that ended in December 2018 against Rs 7.42 crore year on year.